A set of eSubmission Guidelines have been created to support staff with setting up, downloading and processing student coursework submissions. 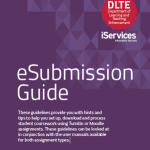 eSubmission refers to the process of students submitting their work online, and many modules already use this method successfully with Turnitin or Moodle Assignments. View the eSubmission page for an overview of the benefits, the two assignment types, and how to get started with designing your assessment for online submission. With the majority of assignments presented in formats that can be submitted electronically, the University is committed to ensuring that this is further extended to become the mode of submission for all appropriate assignments by 2018/19.